» My Stylist Told me To Grow Up! We’ll be back to the subject of food again on Friday. First though, I know that my day with a stylist has garnered interest on Facebook, so today, here’s the story of what happens when you put your fate in the hands of a professional stylist. Oh My!!! Sunday morning last week Judit arrived. Looking raaaaaather swishy. Well, you can’t be a stylist and turn up any other way. Can you?! There I was, glancing down the road as I guided her in, waiting to see what she was wearing, how she styled her hair, her make up. And guess what? She looked great! All blonde hair, pinks and grey tones, cheeky pink ankle boots, a ring that picked out every colour she was wearing (I noticed it all. Wink) and the only black – in a long sleeve – NOT near her face. Yup. You guessed it. That was deliberate too. I’m Wrapped in A White Bib! I’m wrapped in a white bib (to prevent distraction from any other colours … not because I’m about to be fed and am terribly messy – ha) and down to work we get. The previous week I’d spent a good day or two clearing through every room in our home to find clothes/boots/shoes/scarves/coats/jackets/hats/other accessories and taken the entire shebang to the master bedroom. There I began the task of segmenting. This is where it became blindingly obvious that most of my life I’ve made a number of gargantuan errors when choosing colours. Finally, there were the ‘Maybe’ items. They’re the ones with a shade that truly befuddled me. Warm or Cool? Good or Bad? Who knows?! What did this mean? Well, almost half my wardrobe hadn’t suited me before. Almost half wouldn’t suit me in future. And the remainder was sitting lost in No-Man’s-Land. How Are Your Colours Mapped? The basis of colour grouping – with the Colour Me Beautiful style consultancy – is divided into 6 types. Since those heady early days, colour styling has developed in leaps and bounds. It’s now more complex. First you have a primary category. I’d sussed during my clear out that I was moving from warm to cool. Having said that, I didn’t know there was more than ‘warm’ or ‘cool’ to consider! I can’t recall every category of undertone. Mine are ‘soft and cool’ and ‘deep and cool’ …. Okay. Hair unkempt, looking a tad ragged after a poor night’s kip, this was us on styling day. Middle left is my new palette. Middle right an example of ‘warm’ colours that just aren’t ME any longer dahhhhlink! The following 3 hours (can you even imagine how long this task would have taken had I not done my homework and had everything categorised ready for scrutiny?) I gingerly showed every item in my embarrassing wardrobe to lovely Judit and awaited her response. She was polite. I asked her not to be. There were a LOT of no’s. About 3 large bin bags full! I LOVE lace. Have always been attracted to it. The styling is for another day though. 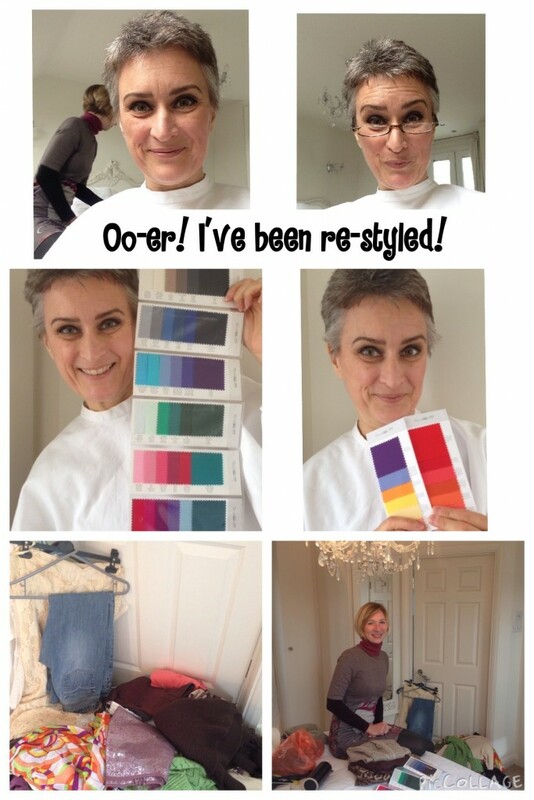 I went for colour styling, a brief make up chat (not the full advice, as I’m pretty ok on that) .. the clear out and .. left styling for a few weeks time when I’ve settled into the new regime! Precisely 4 1/2 hours after we hugged hello, she tripped back to her car (probably exhausted!) leaving me to pack up my bin bags and decide where to take them. In the event, after a couple of phone calls last week, I hopped to a local church and gave them all to the vicar. Here I am with lovely charity worker Gina from Hong Kong who reluctantly took a few items to see her through her holiday here (she travelled light to visit here – said they’d be useful and that she’ll most likely give them to someone else before she leaves) and a lovely helper called Chris. Gina’s dream is to work in the UK full-time. She has a degree in business studies and applied for 100’s of jobs before leaving to return to Hong Kong, after receiving her degree in the UK. Please let me know if you know anyone who can employ someone who would be the most appreciative and hard working member of staff. She’s in the UK for 5 weeks, staying with friends and I know she would happily hop for an interview if there’s one up for grabs! really enjoyed reading this post Sarah. I can really see how your new colour palette works for you.